The president is back. He came back angry. He has spoken to the nation. It wasn’t the typical presidential broadcast, it was an outburst. They said he has been unconscious. He said he has been monitoring political discourse. The rumormongers must have been shocked by his temper. He must have been seething in London. It’s was same old Buhari. His illness may have taken some of his flesh but none of the fire within. He had received a rapturous welcome from his supporters. The competition for obsequiousness must have been won by the Kogi governor. He took the tarmac theatrics home and shut down his state for a whole day. Wike must have frowned his way there, in the interest of national unity. The crowd was unbelievable. Some of the faces in the throng at the airport looked hungry, but they were genuinely delirious. 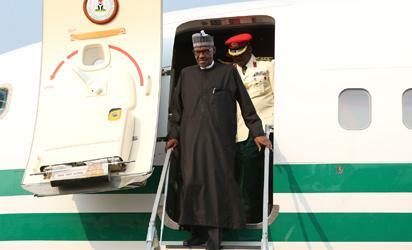 President Muhammadu Buhari on arrival at Nnamdi Azikiwe International Airport, Abuja. AUG 19 2017. The passion for him,in many parts, is very stubborn. Those unimpressed by the enthusiasm of the crowd at the airport claim it was a choreographed sham. Crowds are routinely hired in Nigeria. But Political opponents say things to demystify their popular rivals. The man has returned . It is hoped that rumor mongers can now take a deserved break. He is not dead. And he doesn’t look like one who will die any time soon. Thank God. His speech was brief. It was so brief that its brevity raised eyebrows. A man who has been away for 103 days should have many things to tell anxious countrymen, his ‘dear citizens’. His tone was impatient. It was same old inflexible Buhari. The speech showed lack of political tact or disdain for it. His opponents have gone to town trumpeting familiar accusations of lack of political sensitivity. His supporters say political correctness is hypocrisy. With them, the incorruptible one is irreproachable. They are excited. The acting president performed creditably. But agents of disunity have proliferated, and found temerity, lately. They have pushed the nation to the brink. They want the nuisance checked with urgency. They want the strong hand of the old General. They are happy the president didn’t mince words. The speech failed to impress even moderates and neutrals. Mrs ObyEzekwesili thinks the speech was a missed opportunity. Not a few fault Buhari for being out of touch. The country is divided. Buhari is unbending. Ethnic fires have been lit by hate speeches and quit notices. Buhari wants to fight fire with fire. The country is in dire need of social healing and reconciliation. Many believe that the ethnic and separatist tensions are borne of political and economic frustrations. And they wonder how such political problems can be contained by any army. Those who thought the president would use the speech to announce a cabinet shake up were sorely disappointed. The president showed no anger about the pace of our sluggish economic recovery. Or perhaps the appointed time for the banishment of the jackals and hyenas is yet to come. The speech seemed an impulsive response by an irritated president. The security breeches, he said, had gone way too far. Many agree the security challenges have been allowed to fester. There is no consensus on the methodology for containment. Those who thought the president would address the security concerns as political problems were disappointed by the nakedness of the speech. The aides of the president have defended the terseness of the speech. It wasn’t meant to be a mid term review of his government. It wasn’t an elaborate articulation of the way forward. The president had been on a 103 day medical vacation. He chose to address the nation on his return. He clearly avoided mentioning the nature and scope of his ailment. How could such a speech not be contemptuous of the people? The president has a moral duty to account for his prolonged absence. The Nigerian public waited too long to hear from him. And when he obliged he didn’t bother to tell them if he was now medically fit . The speech ended before many tuned in. This is the eve of electioneering. His illness has left a political suspense that is dissipating the country. No one knows his political future. Many expected the president to address the concerns of the public and settle nerves. But the president’s speech fell short of those routine expectations. And a nation ravaged by uncertainty is handed more puzzles. Members of the separatist Independent People of Biafra (IPOB) are convinced that the speech was a marching order to the army to suffocate the IPOB. The premise is that the inclusion of Boko Haram and herdsmen and kidnappers amongst the threats to be eradicated was a mere smokescreen. The president wasn’t idle in London. He came across comments and discourses on social media that ‘recklessly crossed so many red lines’. The IPOB therefore may not be paranoid after all. Boko Haram and kidnappers generate no heated debates on social media. The president’s supporters want the IPOB to be stampeded into trepidation. President Buhari’s supporters insist that the speech was an affirmation of the president’s long standingcommitment to an indivisible Nigeria. The president said the unity of the country is not negotiable. He wants aggrieved persons to air their grievances, through ‘appropriate channels’. His critics lament that he has abdicated leadership. His supporters are worried. They consider the latter day agitators for restructuring as inconsolable losers. They believe the agitations are political gimmickry. When the principal agitators had the opportunity to restructure the country no one heard from them. The president’s supporters are happy that Buhari who was elected to be tough on law and order was baring his fangs at the right time. It is difficult to prognosticate. The stick method didn’t work in the Niger Delta. The army was sent to arrest the unrest in the creeks. Nigeria’s crude oil production was annihilated. The nation fell into an economic depression. The army was withdrawn. Time would tell if strong arm tactics alone can contain the agitations for separation and clamour for restructuring of the federation. The south east has no way of bringing the country down to its knees without amputating their own nose. The speech that was a warning to those who had crossed many red lines was recklessly scripted. A taciturn General preoccupied with law and order may be pardoned for lack of grammatical finesse. But that speech crossed too many grammatical red lines. Its poor linguistic quality left many wondering how a six minute prepared speech could contain such an eternity of errors. A national broadcast cannot be riddled with kindergarten errors. Everyone who listened to the speech was baffled by its disjointedness. His supporters said the meaning of the speech was not lost on anyone. But how could a president talk about the need for a ‘relentless destruction of criminals?’. Criminals are not terrorists and they are not at war with the country. General Buhari is not Mr Rodrigo Duterte of the Philippines. His speech writers must not portray him in negative, rumour spawning, light. President Buhari is a born again democrat. He didn’t intend instructing security agents to destroy criminals. A presidential address should benefit from professional proof reading. The president has resumed. The ‘corpsocracy’ theorists have been put to shame. But there is an epidemic of shamelessness. He has met his service chiefs. He is working from home. His supporters wish he was working from his office. The last time he worked from home, he left home for London. Tongues are wagging again. They are singing déjà vu. Garba Shehu tried to still them and dismiss their mischief. He said rats ransacked the president’s office. Opponents of the president have asked him to shop for a better lie. Rats happen everywhere. They have been found in the White House. But they didn’t chase away any president from the oval office. Dr Reuben Abati once talked about resident demons in Aso rock, inflicting impotence and cancers on occupants. The irreverent rats left a well resourced Aso villa kitchen and penetrated an air tight office to eat air conditioners. They are no ordinary mischief makers. They will defecate poisons. They may not succumb to ordinary ‘Otapiapia’. A legion of Imams may be needed for a thorough clean up. Pastor Adeboye was in London. He could be recalled. That is his specialty. Clerics can be trusted to deliver spiritual ‘kill and dry’. The president made a revelation to his wife. We heard from her. The days of the hyenas and jackals that have menaced the country are numbered. We cannot therefore sit astride and watch mere rats distract the president now. Football fans see all the errors. While the president became a social media spectator in London he should have noticed the sluggish pace of our economic recovery. He should have come back fuming in the right direction. I am optimistic. Many believe his anger is still rumbling. And will be felt in the jungle. The president has many more six minute roars to make. The president must build national consensus and pursue economic prosperity. His methods must be objective and foresighted. The post The Return of the Lion King, Red lines and a Six Minute Roar appeared first on Vanguard News.